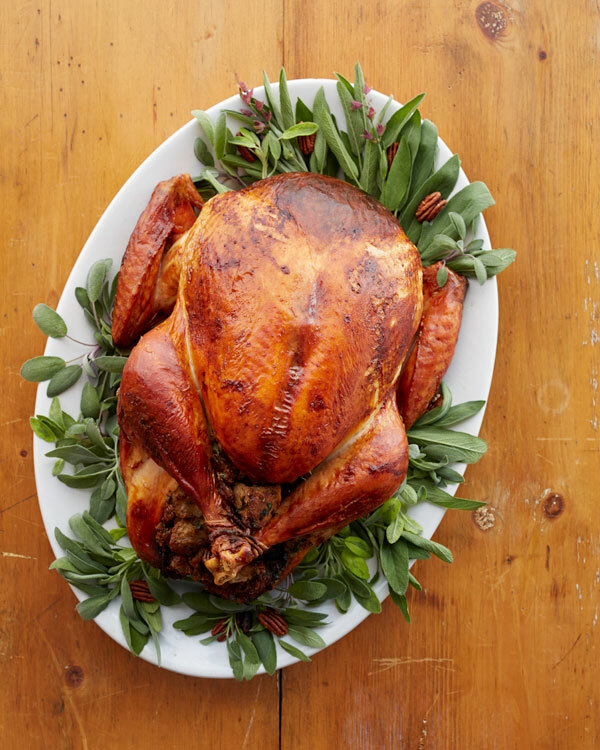 Martha offers a primer on turkey and shares her recipes for Turkey 101: Roasted Turkey in parchment paper, Braised Turkey Legs and roasted rolled Turkey Breast with herbs, all sure to be year-round favorites. Martha Stewart braises turkey legs in a rich, herb infused stock. Learn how to make this roasted rolled turkey breast with herbs recipe from Martha Stewart's Cooking School. Combine butter, orange zest, parsley and sage in a medium bowl. Stir to combine; season with salt and pepper. Evenly distribute half of butter mixture under skin of turkey breast. Flip turkey breast and rub remaining butter evenly on inside of breast; season with salt and pepper. Starting with one short side, roll turkey breast into a log shape, tucking ends under to ensure even cooking. Using kitchen twine, tie breast at 1-inch intervals. Season generously with salt and pepper; set aside. Arrange onion slices in bottom of 12-inch ovenproof sauté pan and scatter carrots around perimeter of pan. Add 1 cup chicken stock to pan and place turkey breast, seam-side down, on top of onions. Transfer saute pan to oven and cook, basting turkey and vegetables every 15 minutes with pan juices, until turkey reaches an internal temperature of 150 degrees and juices run clear, about 1 hour 30 minutes. After an hour, tent turkey with foil to avoid overbrowning. Transfer turkey breast from pan to cutting board and cover loosely with foil. Let stand 15 minutes before slicing. Meanwhile, remove and discard vegetables from saute pan. Transfer pan juices to a fat separator; discard fat. Place pan over medium-high heat and add orange juice, scraping up any brown bits from bottom of pan. Return defatted pan drippings to pan and stir to combine. In small jar with tight-fitting lid, combine remaining 1 1/4 cups chicken stock with flour and shake to combine. Slowly add chicken stock mixture to pan, whisking to incorporate. Continue to cook until thickened, about 8 minutes. Season with salt and pepper. Slice turkey breast and serve with gravy.